Bring this 1-piece toilet from American Standard into your home for a dependable, high-quality toilet. Create less water waste with the dual-flush system. Its durable vitreous china design will keep your bathroom looking beautiful, flush after flush. American Standard has one-upped the competition with a sleek, stylish high-efficiency toilet with the Cadet FloWise Complete that installs without any tools. This two-piece toilet comes with a lined tank that inhibits condensation buildup and an EverClean-surfaced elongated bowl that keeps its shine. It releases a modest 1.28 GPF, worthy of the EPA's WaterSense distinction for sustainability, yet powerful enough to swiftly propel the bowl's contents down the drain. Smarter design for higher performance and fewer clogs all at a great price. The Cadet. 3 series toilets come in a variety of styles; one piece and two piece models, elongated and round front bowls, right height and compact versions and even water efficient models that flush on just 1.28 gallons per flush. The Cadet 3 is a hard working versatile series with superior performance. The Cadet 3 series receives the highest ratings in bulk removal test between 990-1,000 grams. The Mainstream 4.8L Elongated toilet from American Standard includes a tank liner that reduces condensation and a color-matched solid plastic seat and cover. 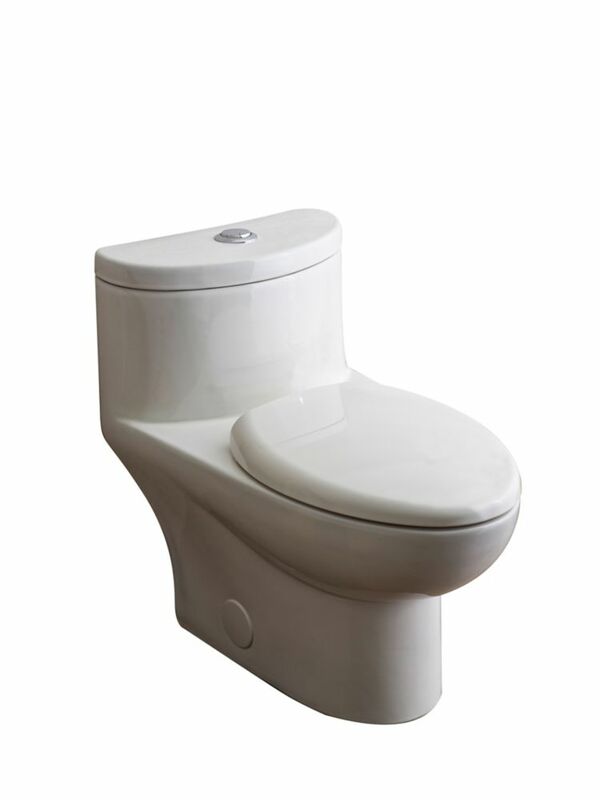 This complete toilet solution features an elongated bowl with a standard height. With a low flow rate of 4.8L per flush, the Mainstream toilet will help your family save water! The VorMax Plus, self-cleaning toilet freshens the bowl with every flush. VorMax Plus combines Lysol and the uniquely powerful VorMax flush hydraulics, offering the ultimate cleaning experience with just a flush - no extra steps. The VorMax flush alone cleans 2x better than conventional toilets with just water. American Standard took VorMax Plus to the next level by incorporating the cleanest VorMax flush and its scrubbing power and infusing Lysol into the water. The result is a cleaner bowl that helps prevent staining and buildup with no extra work-it cleans the bowl every time you flush. The VorMax Plus toilet offers a truly effortless cleaning experience. Tofino 1-Piece Dual-Flush Elongated Bowl Toilet Bring this 1-piece toilet from American Standard into your home for a dependable, high-quality toilet. Create less water waste with the dual-flush system. Its durable vitreous china design will keep your bathroom looking beautiful, flush after flush. Tofino 1-Piece Dual-Flush Elongated Bowl Toilet is rated 3.9 out of 5 by 90. Rated 5 out of 5 by Gray67 from Easy to clean, easy to install, great flush. Looked for a one piece, easy clean, dual-flush, normal height toilet and this was the only one I could find. Very pleased so far. Quiet, low profile and a great flush. Also appreciate the lower height. I am not a fan of these "right-height" toilets that perch you too high on the throne. Even though it is dual flush, I have only ever had to use the smaller flush -One month of use and not too much Mexican food yet ;) Way easier to install than expected. The reviews I read made it sound difficult but if you are at all handy this will be no problem. Rated 5 out of 5 by mola2alex from Great toilet This is my second one. Never clogs, looks good and comfortable. Would but again if need a new one. Rated 1 out of 5 by Julia from Condensation from the tank We bought this toilet on the weekend. We installed in correctly. It has been 3 days and it continues to have an excess amount of condensation coming from the toilet boil area and going down into the back of the toilet, where you can not reach due to the design of the toilet. I have cleaned it several times, checked the water connection and the water is definitely coming from the outside of the toilet. It does not have any kind of liner or insulation. We have bought other American Standard toilets and not had this problem. After spending almost an hour on hold with American Standard customer service, the agent explained to me how condensation works and I was told there was nothing we could do about it. The temperature in the house is 21 and the water is municipal. Because the toilet has been installed, we can not return it. Rated 1 out of 5 by Craig from Strongly Dislike this toilet The only thing I like about these toilets is that the tank and bowl are one piece. Other than that its heavy, awkward, the seat wobbles, the flush is weak, and you have to use brass toilet bolts that come with it to install so if you set the toilet on them by accident you run the risk of cracking the toilet. plus the small access to tighten the nut onto the bolts is so small you can only get two fingers on it to tighten it down (no tool will fit) this creates the risk of the toilet coming loose and leaking. Rated 5 out of 5 by Norma Bourque Niles from Our new elongated toilet looks very nice! Love... Love! Fits nicely in our renovated bathroom. Rated 3 out of 5 by Cynthia in Ontario from nice looking this toilet is nice looking but i find it does not flush paper when using the "light" flush button so therefore i use the larger volume button when paper is used. Yes the Tofino comes with a slow close seat included. How deep (front to back) is this toilet? What is the MaP Score for this toilet? American Standard model 2996C was MaP tested in March 2013 receiving a 1000 gram flushing score. If you would like a copy of the test report please contact customer service at 1-800-387-0369. Does this toilet have an Aquaguard tank liner? I bought this toilet 2 years ago and I love it. One of the bolts that hold the toilet seat in place has come undone and won't screw back in. It seems to be broken which makes the seats shift from side to side. Where can I purchase a replacement bolt? Before I buy, I like to know if this toilet very hard to install.. if so, why is it so poorly designed? And is it easy to replace the toilet seat?